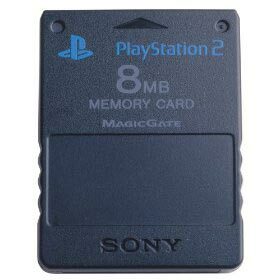 8MB Playstation 2 Memory Card. This is an original Sony brand memory card, not third party. Colors may vary. Save your games with a PlayStation 2 Memory Card. Sony's Memory Card features a high data transfer rate, Sony's reliability and a hefty 8MB of RAM. As someone who prefers first-party accessories, I was very pleased by the cost and quality of this memory card. I've had no issues with it since purchase and it has been compatible with every game I've played. Unless you want to leave your console on 24/7, a memory card is a must-have. Definitely go with a high quality one like this one. Deliveries came in on time and both cards work perfectly. If you're looking to do some "archaeology" however, your chances aren't perfect. Some cards are wiped while others are not. I was surprised, the memory card came in great condition and works perfectly. It was very cheap and well worth the purchase; especially if you’re like me who losses memory cards smh. Anyways if you’re considering purchasing a memory card - Go for it! You even get 9 Lukie Points! Received the memory card in perfect working condition. Now ready to have a great time !! I ordered a PS2 memory card from here and I was quite impressed. I'm not a fan of the bootleg memory cards other companies sell, so i was pleased to receive the original memory card! Works like a charm! The pins needed to be cleaned a little, but it works perfectly now. Overall, it arrived in great condition. I misplaced my PS2 memory card, and this one works perfectly! Also great for the price! I ordered two and have had no issues with my memory cards since purchase. I will be buying more of these in the future. Came quickly and in great condition. Customer service was quick to respond when I had an issue with my shipping address. Will be making more purchases on this site in the near future! Came in good condition. Had to delete old saves, but would still recommend.